, the elder of three justly celebrated printers, was born about 1447, at Bassiano, a small town in the duchy of Sermonetta, He was educated at Rome, under Caspar of Verona and Domitius Calderinus, both of whom he has mentioned in several of his prefaces, as men of talents and erudition. Having acquired a knowledge of the Latin language from them, he went to Ferrara to study Greek under Baptist Guarini, and, probably after his own studies were completed, became the preceptor of the prince of Carpi, a nephew of the celebrated Picus of Mirandula. In 1482, Ferrara being closely besieged by a Venetian army, he retired to Mirandula, and spent some time in the society of Picus, who, though not quite twenty years of age, was already a consummate master of almost all learning. 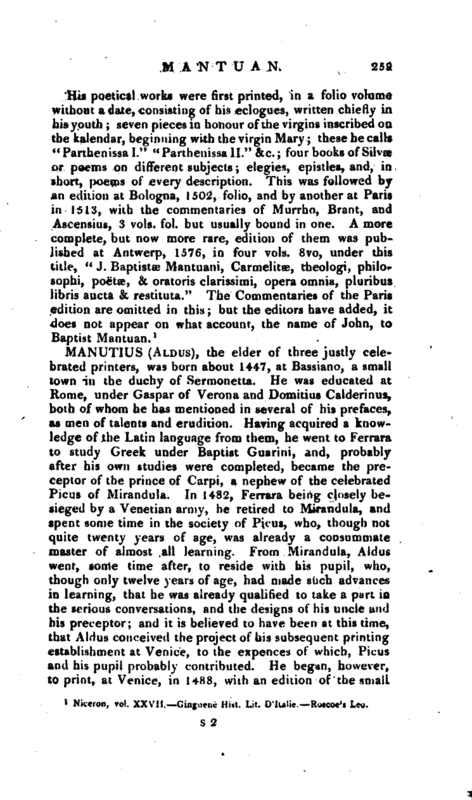 From Mirandula, Aldus went, some time after, to reside with his pupil, who, though only twelve years of age, had made such advances in learning, that he was already qualified to take a part in the serious conversations, and the designs of his uncle and his preceptor; and it is believed to have been at this time, that Aldus conceived the project of his subsequent printing establishment at Venice, to the expences of which, Picus and his pupil probably contributed. He began, however, to print, at Venice, in 1488, with an edition of the small | Greek poem of Musseus, in quarto, with a Latin translation, but without date. In 1494 he published the Gre*k grammar of Lascaris, and in 1495, in one collection, the grammatical treatises of Theodore Gaza, Apollonius, and Herodian. He had already begun to prepare for the press the manuscripts of the then unprinted originals of the works of Aristotle, which, in number and extent, were sufficient to fill five volumes in folio. Although the state of these Mss. required almost incredible efforts of diligence and erudition, Aldus brought out a first volume in 1495; and the edition was completed in 1498. Aldus was from that time confessed, without dispute, to stand as an editor in the very first rank among his contemporaries. He was not, however, the very first that printed an entire Greek book. The Greek grammar of Lascaris had been printed in folio, at Milan, in 1476. The works of Homer were printed at Florence in i 488; and several other Greek works had also appeared in print, when Aldus began his establishment; yet he must be allowed the praise of having first used elegant Greek types, and printed from the most correct and authentic manuscripts. In imitation, it is said, of the hand-writing of the celebrated Petrarch, Aldus procured the first examples of that which is called, in printing, the Italic character, to be cut and cast for him by Francesco of Bologna, about 1500. 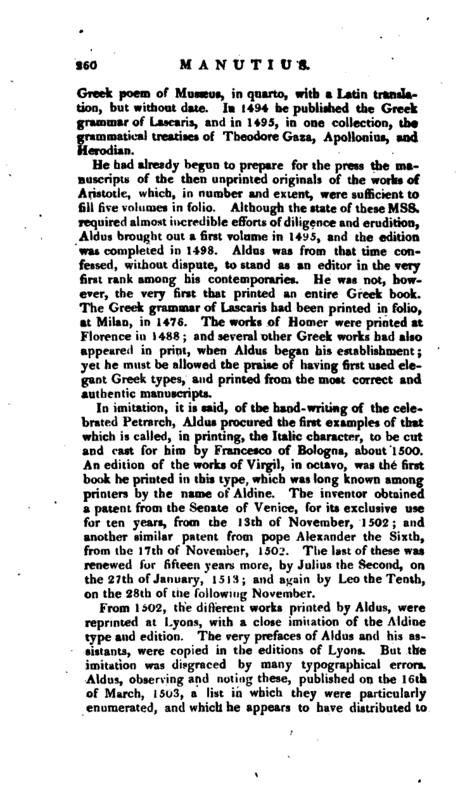 An edition of the works of Virgil, in octavo, was the first book he printed in this type, which was long known among printers by the name of Aldine. The inventor obtained a patent from the Senate of Venice, for its exclusive use for ten years, from the 13th of November, 1502; and another similar patent from pope Alexander the Sixth, from the 17th of November, 1502. The last of these was renewed for fifteen years more, by Julius the Second, on the 27th of January, 1513; and again by Leo the Tenth, on the 28th of the following November. From 1502, the different works printed by Aldus, were reprinted at Lyons, with a close imitation of the Aldine type and edition. The very prefaces of Aldus and his assistants, were copied in the editions of Lyons. But the imitation was disgraced by many typographical errors. Aldus, observing and noting these, published on the 16th of March, 1503, a list in which they were particularly enumerated, and which he appears to have distributed to | the purchasers of copies of his own genuine editions. The cunning and industrious Lyonnese took this list of their errors, corrected them in new editions of the same books; and thus still divided the market with Aldus, and now more successfully than at the first. In 1501, 1502, 1503, 1504, and 1505, Aldus printed in folio, or in octavo, a considerable number of the best authors, Greek, Roman, and Italian, such as Demosthenes, Lucian, Dante, Horace, Petrarch, Cicero’s epistles to his familiar friends, Juvenal, Lucan, Homer, Sophocles, Euripides, &c. &c. He published, at the least, a volume every month. These publications were in all respects excellent. They were of works the most valuable in all literature, ancient or modern. The composition of the types was finely regular and uniform; the press-work was admirably executed; and the ink so truly good, that it retains to this day all its beauty and lustre of colour. In the necessary pains upon these works, Aldus had the assistance of some of the best and most learned among his contemporaries. His house became a sort of new academy. The learned in Venice began, about 1500, to assemble there on fixed days of frequent recurrence, for conversation on interesting literary topics: and their meetings were continued for several years subsequent. The topics on which they conversed were, usually, what books were fittest to be printed, what manuscripts might be consulted with the greatest advantage, what readings, out of a diversity, for any one passage, ought to be preferred. Among those who attended these conversations, were, besides Aldus himself, the famous A. Navagerus, P. Bembo the celebrated cardinal, Erasmus, when he was at Venice, P. Alcionius, M. Musurus, Marc-Ant. Cocch. Sabellicus, Albertus Pius, prince of Carpi, and others, whose names, though they were then eminent, are not now equally in remembrance. 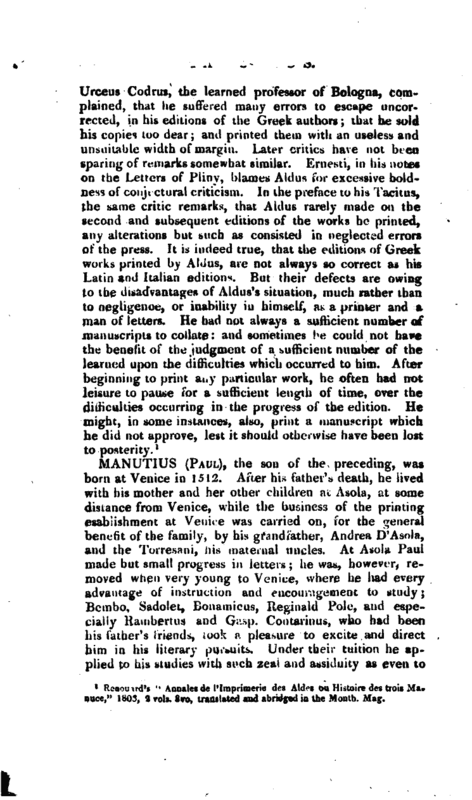 Among those who assisted Aldus in the correction of the press, were men not less eminent than Demetrius Chalcondylas, Aleander, afterwards famous as a cardinal, and even Erasmus. There are some curious circumstances in the history of the acquaintance and connexion between Erasmus and Aldus. 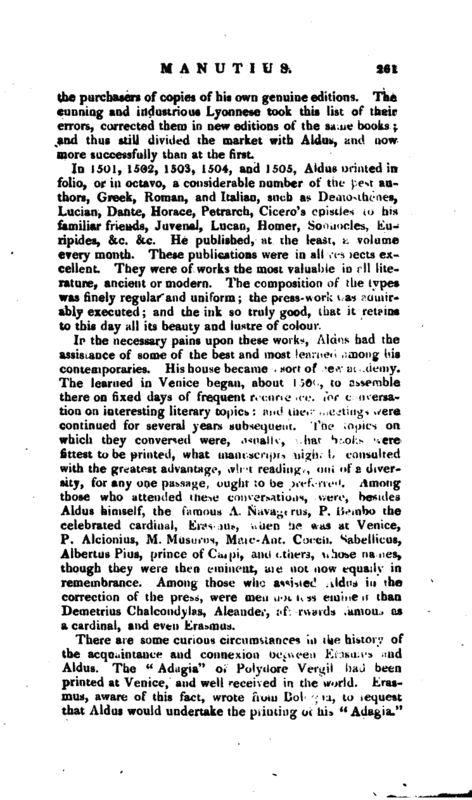 The “Adagia” of Polydore Vergil had been printed at Venice, and well received in the world. 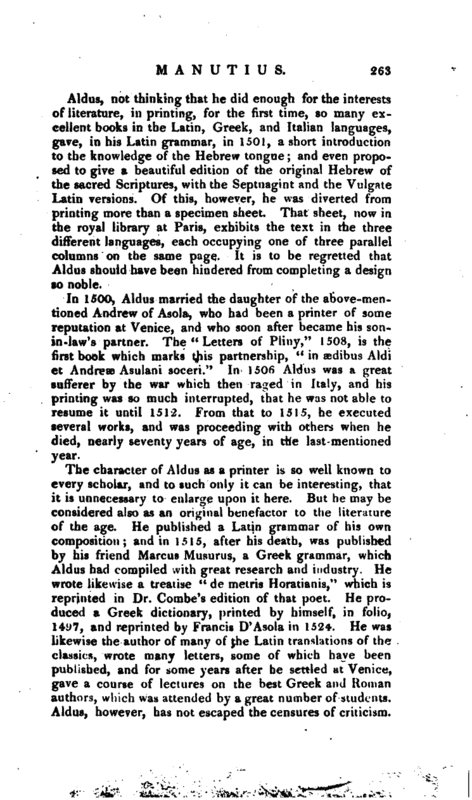 Erasmus, aware of this fact, wrote from Bologna, to request that Aldus would undertake the printing of his “Adagia.” | Aldus readily agreed to the proposal, and invited Erasmus upon it to Venice. When Erasmus came, it was not till after some delay that he obtained admittance to the printer’s closet, whose servants were not aware of the stranger’s Jiterary consequence. But Aldus no sooner knew that it was Erasmus who waited for him, than he hastened to rer ceive his visitor with open arms. He did more he stopped the progress, of several important Greek and Latin works, which he had then in the press, to make room for the printing of the great collection of Erasmus with the desired, expedition. Erasmus was, in the mean time, entertained in the house of Andrew d‘Asola, father-in-law to Aldus, with whom Aldus and his wife appear, by Erasmus’s account, to have lived. D’Asola was rich; yet his table was, even for that of an Italian family, parsimoniously served: and Erasmus loved good cheer. The Dutchman made frequent remonstrances to his friend Aldus, against the thinness of the soups, the absence of solid animal food, the weakness and sourness of the wine, the general scantiness of the whole provisions. The Italians, whose climate and natural habits had taught them to live much more sparingly than was usual for the Dutch and Germans, were astonished and offended by his complaints. Some small additions, such as a fowl or two, and perhaps half a dozen eggs a week, were made on his account to the commons of the family. But these dainties were sometimes intercepted by the women in the kitchen, on their way to the table. On the table, they were devoured by the rest who sat at it still more eagerly than by Erasmus. 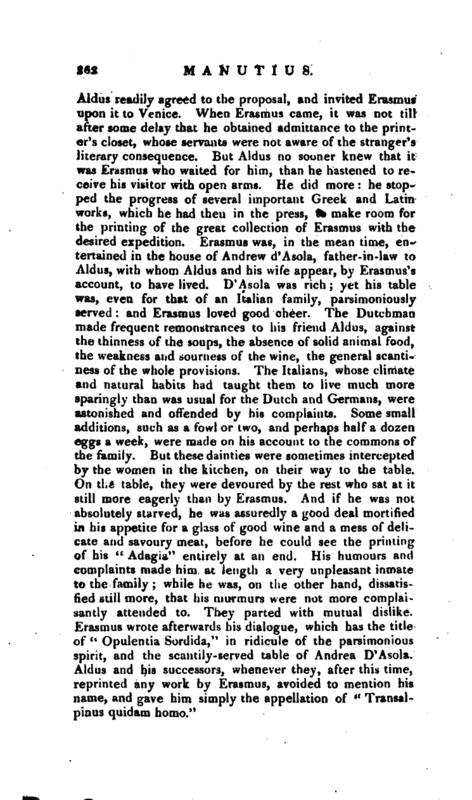 And if he was not absolutely starved, he wiis assuredly a good deal mortified in his appetite for a glass of good wine and a mess of delicate and savoury meat, before he could see the printing of his “Adagia” entirely at an end. His humours and complaints made him at length a very unpleasant inmate to the family; while he was, on the other hand, dissatisfied still more, that his murmurs were not more complaisantly attended to. They parted with mutual dislike. Erasmus wrote afterwards his dialogue, which has the title of “Opulentia Sordida,” in ridicule of the parsimonious spirit, and the scantily-served table of Andrea D’Asola. Aldus and his successors, whenever they, after this time, reprinted any work by Erasmus, avoided to mention his name, and gave him simply the appellation of “Transalpinus quidain homo.” | Aldus, not thinking that he did enough for the interests of literature, in printing, for the first time, so many excellent books in the Latin, Greek, and Italian languages, gave, in his Latin grammar, in 1501, a short introduction to the knowledge of the Hebrew tongue; and even proposed to give a beautiful edition of the original Hebrew of the sacred Scriptures, with the Septuagint and the Vulgate Latin versions. Of this, however, he was diverted from printing more than a specimen sheet. That sheet, now ia the royal library at Paris, exhibits the text in the three different languages, each occupying one of three parallel columns on the same page. It is to be regretted that Aldus should have been hindered from completing a design so noble. In 1500, Aldus married the daughter of the above-mentioned Andrew of Asola, who had been a printer of some reputation at Venice, and who soon after became his sonin-law’s partner. The “Letters of Pliny,” 1508, is the first book which marks this partnership, “in sedibus Aldi et Andreae Asulani soceri.” In 1506 Aldus was a great sufferer by the war which then rag;ed in Italy, and his printing was so much interrupted, that he was not able to resume it until 1512. From that to 1515, he executed several works, and was proceeding with others when he died, nearly seventy years of age, in the last mentioned year. Renouard’s “Annalesde I’lmpriuierie des Aides ou Histoire des trois Manuce,” 1803, 1 vols. 8vo, translated and abridged in the Month. Mag.